Last Friday team Killer Snails headed west to the Intentional Play Summit in Mountain View. Our goal was to learn with some of our most inspiring colleagues from experts in education, games for social impact, emerging technology, and researchers from leading institutions. Dozens of thought leaders led talks and workshops in a whirlwind daylong conference about the power and potential of games as tools for learning and social-emotional growth. Bret Victor launched the day with a compelling keynote about Dynamicland, the community workspace that is also a form of computing media. Victor’s vision of is one of collaborative computing that highlights our uniquely human attributes where technology augments our ability to learn and grow together. Learners work together to create, craft, code and then recode real objects in the physical world. The afternoon keynote was given by Dr. Mimi Ito of Connected Camps and Connected Learning Research Network. Dr. Ito inspired the audience to find the place where interests, relationships, and opportunities collide as the space for truly connected learning. Despite living in a largely disconnected world, Dr. Ito is working to build environments that allow peers to connect with one another in meaningful ways. “Connecting with peers helps students unfamiliar with non-traditional careers by inspiring and changing the trajectory of a student’s story” says Dr. Ito. During lunch there so dozens of excellent choices for learning and connecting with colleagues in the education, gaming, research, and design community that choosing one was quite difficult! I decided to join one of the thirteen roundtables facilitated by Dr. Michael John of USCS Games and Playable Media. Together our group of a dozen attendees discussed what aspects of game development should be taught in the classroom from reducing bias to increasing empathy. Chief Education Officer of iCivics Dr. Emma Humphries discusses the collision of two trends: games and news literacy! A series of short TED-inspired talks allowed attendees to convene in a shared space to learn about the future of mixed reality in the classroom, the cognitive science underlying game design, the science of immersive technologies and the colliding trends of games and news literacy. Aleissia Laidacker, programmer and designer Magic Leap, took the audience on a deep dive into the affordances of Mixed Reality. 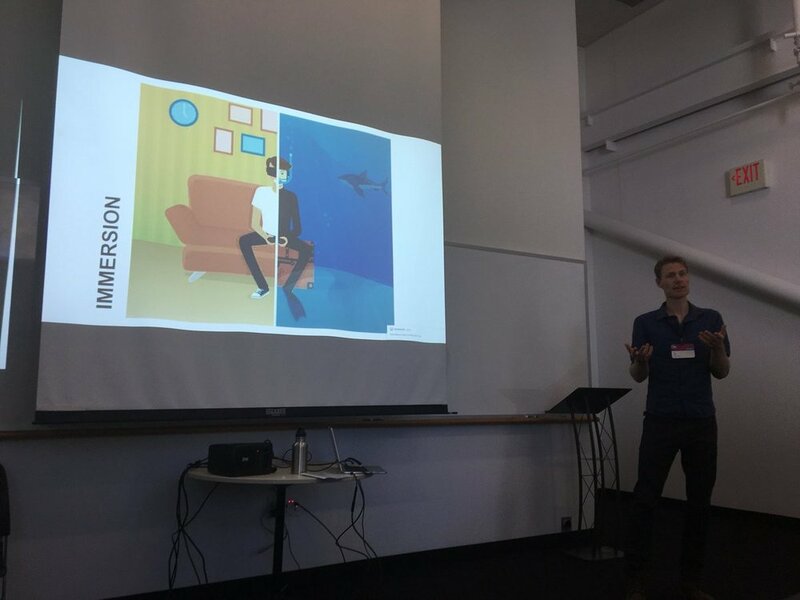 Killer Snails co-founder and Chief Learning Officer Dr. Portnoy gave a talk on the relationship between cognitive science and the development of immersive learning experiences. Michael Casale, Chief Science officer at STRIVR, shared insights from training with immersive technologies. Emma Humphries, Chief Education Officer of iCivics closed out the exciting session by talking about the role of games in teaching about news literacy and revealed the latest addition to the iCivics roster of games: Newsfeed Defenders. Filament Games CEO Dan White talks about the impact of the immersive nature of VR on learning. Before demo-ing our latest Virtual Reality experiences Scuba Adventure and BioDive we were able to check out two lasts sessions. The first was led by Adam Bellow and Mark Hammons of Breakout EDU. While our team didn’t actually break out of the box, we did break into a great talk about the importance of communication, collaboration, and hard work as essential elements for a successful team! Before setting up to demo our latest learning games we were able to hear from Filament Games CEO Dan White about how VR changes learning. From embodiment to immersion, impact to identity, he shared 6 theories of how he sees the future of VR changing the landscape of learning. KS Teacher Ambassador Amanda Solarsh & Chief Learning Officer Dr. Lindsay Portnoy demo KS VR, digital, and tabletop learning games. A special thanks to Jen Helms, founder and chair of the Intentional Play Summit, who curated an extraordinary group of indie games, thought leaders, and a wide range of sessions to captivate all of the attendees of the 2018 Intentional Play Summit. Team Killer Snails can’t wait to play again next year! Older PostScuba Adventures: Philippines- coming soon!